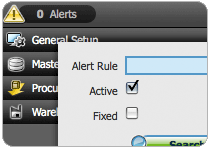 Notifications can be programmed to alert the user whenever a certain condition - for example when inventory is low, a customer has overdue payments, etc. - is met. These Alerts are then made clearly visible to user as soon as they log in to the application. Isn't that a great feature to help ensure proper control? 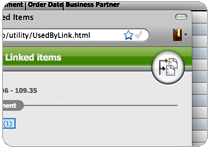 From any record in the application, users can access any other record in the application that is linked to it, as long as their permissions allow for it. Finding related invoices, contacts or any specific shipping receipt is very easy. With Openbravo, your users are always empowered with a 360 degree view of all the data in the application. 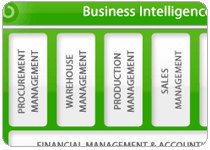 End users easily create customized report formats based on multiple fields and categories in order to extract critical integrated company data. 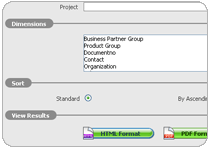 New reports can be added to the ERP in as little as a few hours. Easy access to information is a critical component of a successful ERP implementation, and Openbravo builds it right in. Openbravo understands that your business is unique and we have designed our product so that it is easy to extend and configure to be a perfect fit for your requirements. Thanks to our revolutionary model driven-development architecture, you can tailor existing functionality and business rules, as well as add new functionality without any programming. Openbravo ERP can help you to differentiate yourself from your competition.